That Sunday we saw 5 young people come to Christ!! 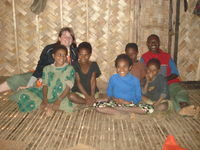 There is a wonderful work going on in Kotidanga, the Allen’s base of ministry. The work done on the airstrip is phenomenal. Matt’s ministry of flight is already a tremendous asset and will be even more so when he can use the airstrip being built, just minutes from the house! The clinic ministry touches so many lives. I thoroughly enjoyed watching my daughter Rachel work there and was even able to be a help by packaging medicines! The vision of John and Selina Allen, Matt’s parents (currently on furlough), is evident as we saw the healthy babies on the milk program, mothers at a pre-natal exam, students reading and writing, and John’s library filled with language and translating books! Sarah Glover’s reading and writing clubs for her post-literacy class students were tons of fun and really helped me with my Pidgin. It was great to see the students, especially the Bible School guys, work at improving their reading and writing skills. They are very enthusiastic when Sarah reviews something with a game! Rachel - Kenias - 5 souls SAVED!! Pastor James, the national pastor of Kotidanga Baptist Church is an excellent leader with a big vision for his people. Pastor James was away during part of our stay preaching at a revival meeting, his wife teaching some classes for ladies. They saw over 40 salvation decisions in this meeting!! The Kotidanga church is holding a bung (a fellowship) in January and preparing for a thousand guests! This involves building several new brush arbors, building extra bush huts for guests, and planting and caring for a large garden. The church is already preparing special music and Trina had an opportunity to help with the new choir. I am especially thankful for the two opportunities I had to preach in the Kotidanga church. The folks there are so kind, patient, and attentive to the Word – even when over 180 of them are crowded into their one room church building! Trina had two opportunities to share a Bible lesson with the children – and Rachel got her first experience translating for her mom. Pastor and Matt have a vision for outreach too, among the Kamea, in PNG, and throughout the world! The church plant in Aminawa, started by John Allen and now being continued by Andrew Schellenberger, is progressing wonderfully. I was so blessed by an opportunity to preach one of the 3 services in this village one Sunday. Andrew taught first, continuing the chronological teaching, now being at the account of the giving of the Ten Commandments to Moses. I then preached on the blood covenant God made with Abraham. Kenias, the young national preaching and translating for Andrew into Kamea, did an amazing job in the third service, preaching about the blood of Christ: how it fulfilled the covenant and provided salvation for us! That Sunday we saw 5 young people come to Christ!! Rachel went along with us and got to share the plan of salvation in Pidgin! I need to add here how terrific it was to watch Andrew and Rachel work together in ministry. We are so blessed by their upcoming wedding and I had the special privilege of doing over a dozen hours of pre-marital counseling with them while we were there. They will continue to be a big part of this great work and the That They May Know Team! I LOVED teaching five sessions in the Bible School, one on Missions and four on Christian Character and the Family!! This school is another ministry of Kotidanga Baptist Church. How exciting it was to be a part of the growth of these young men preparing for full time Christian service! I am sure I challenged Matt and Andrew as they translated for me, and I know I gave everyone a few good laughs the way I tried expressing ideas in simplified English. God allowed us to be a special encouragement to these young men and their families through the provision of foam mattresses, blankets, and pillows. They have left their homes and gardens, their means of provision, to study the Word. We were blessed to “boost” their faith a bit, providing something that we take for granted in our country! We are so thankful for the gracious hospitality of the Allens and each of the TTMK team members! Thanks John and Selina for your bed! (Oh! And it was so cold, Selina, Trina had to borrow some socks!) They were so patient in taking time to answer all our questions, and went out of their way to give us as many opportunities to serve and learn as we desired. Becky gave Trina a room by room tour of the house, detailing things that had been purchased in and out of the country, cost, and options to consider for our future home. Matt did the same with me from a design and building aspect. They shared practical information about getting supplies, but most importantly shared a passion for the needs of the Gulf and Western province that God used to direct me and expand my vision of the work God has for us in Papua New Guinea!! The Gulf and Western provinces of Papua New Guinea have been neglected by their government. The people there are without roads and adequate transportation. In many cases they are without schools or access to health care at even the most basic level. But worse than this, they have been neglected by those that could bring a true, clear gospel. The Catholics did not neglect these people, nor the United Methodists. The people of this area have conveniently mixed their traditional pagan belief systems with the new pagan belief systems presented to them – particularly as those ministries offered to provide social services to their villages. There is only one Baptist missionary in the Western Province: Jason Russel, now preparing for his third term and the planter of 3 churches. In the entire Gulf province there are currently two works headed by Baptist missionaries: John Gray in Kerema and the Allens in Kotidanga. Soon, the Helzermans, now in the country, will be up in Kaintiba. That will make a third – and God has called us to be another, centering our ministry at Ihu! Ihu and the surrounding area is a place for which Matt Allen has been burdened. He has taken several of the men who have visited him, praying about ministry in PNG, to spend time with this Orokolo people group along the coast and up several of the rivers that empty there into the sea. Together we planned a 5 day trip into this part of the country. We were blessed to be able to fly into Apea, a city up the Vailala River with an airstrip maintained by the logging company, and then hire a dinghy and driver for travel up and down the rivers and across the saltwater bay. Traveling with Matt, Trina and I were Jerry and Jack. Jack is a graduate of John Gray’s 3 year Bible School in Kerema, planting a church in Malalaula. Jerry Miri is a graduate of the same school. Jerry has been praying about a church plant in Ihu, even obtaining a 99 year lease from the government there for land already!! 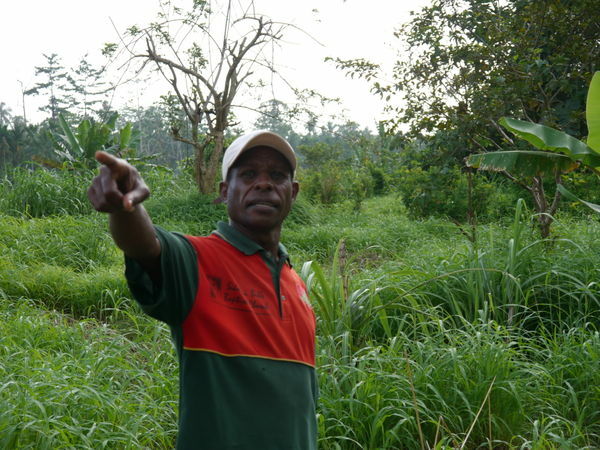 He would have liked to have had the land cleared before our arrival, but his wife’s serious case of malaria and recent breast cancer diagnosis prevented them from spending much time preparing in Ihu. He shared an interesting thought with me one evening. He said, “We are blinded by things in our culture that keep us from seeing all of God’s ways for us. We need someone outside of this to show us those truths of God we miss.” What marvelous insight! And how I was challenged as I thought, we too, as Americans are often blinded by our own culture, failing to apply God’s Word properly and completely. Jerry has been praying for something else too: a missionary to come and work along side him, building the church, reaching out into the whole Coastal Orokolo people group, and training the men who are called, and will be called into God’s work. This is a vision and call we now share! God broke my heart for these people of the Coast. The men preach using an English KJV Bible and would like the Bible School classes in English. This is understandable as English is considered the language of educated people and proper for adult schooling. As some of the prospective students are currently pastoring, I would love to see the school schedule accommodate their traveling home on the weekends, perhaps with classes held Tuesday through Friday. We would also love to provide our Bible School student’s with educational opportunities for their children while they are enrolled and special classes for wives. 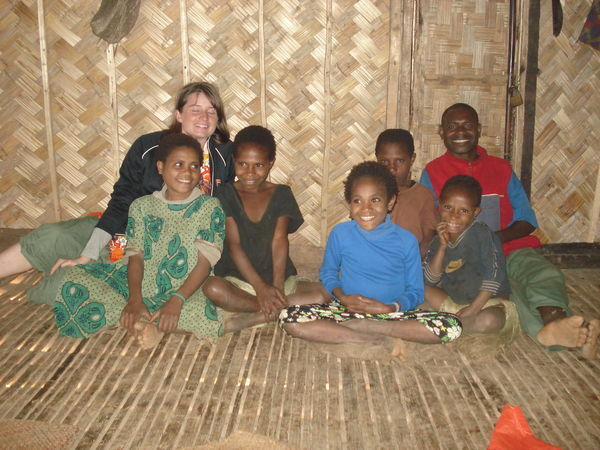 Trina and I would still need to speak fluent Melanesian Pidgin and see a real need to be able to teach and preach in Orokolo, as this is the language in which the pastor’s preach, and in which local people think, pray, and communicate amongst themselves. The last 5 days of our trip were spent in Port Moresby as Matt combined a supply run, taking us to the airport, and a revival meeting into one trip! We did get a lot of information shopping around town, even pricing a kit house and a dinghy with 40 hp outboard motor. A boat would be invaluable for church planting and discipleship ministries, along with being a primary means of our getting supplies to Ihu. Of course, much more enjoyable than shopping were the meetings at Morata Baptist Church with Pastor Holmes Tako. Pastor Tako and his wife, Prisila, were saved in this church when it was still headed by a missionary over 20 years ago. That missionary is now retired and in the states and this PNG work sends him $100 in monthly support!! What a tremendous testimony!! Matt preached once each day, Sunday through Thursday, and we know of at least a dozen professions of faith. On Wednesday evening, as it would be Trina’s and my last night to be there, the church ladies presented all the missionary ladies with matching laplaps and meri blouses (skirts and traditional PNG tops), and gave Matt and I several bilums (carrying bags, not purses, used by men and women! J) Pastor’s wife had fixed us a feast before the service and I am glad I was not the one preaching after eating all that food! We left very early Thursday morning, but we did not feel as if we were traveling “home”. We were instead leaving home, and we are eager to return! We thank you so much for your prayers that accompanied every element of this trip! We are so convinced of the advantages of team missions as we observed the work in Kotidanga that we are asking you all to begin praying for a couple to join us, beginning a new Ihu team! We also need your continued prayers that God would bless our deputation travels and speedily provide church partners for us in seeing this big work begin!